Ode to the Prefect Croissant. | Life in Paris with a limited wardrobe. Life in Paris with a limited wardrobe. Ode to the Prefect Croissant. Pierre Hermé and I go way back. Before I knew how to write in passé simple, I was translating his recipes for my dear friend in Kansas. So it was when I was touring all over French and decided to spend two week in Paris that I actually tried Pierre. And it took me many, many years for me to even try anyone else’s macron. I’m a Pierre girl all.the.way. 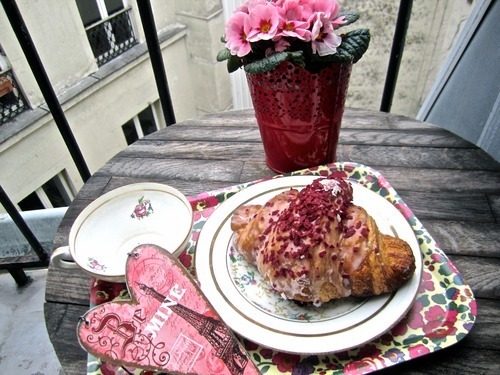 I recently picked up his Ispahan croissant. I really didn’t have that much expiations for it. 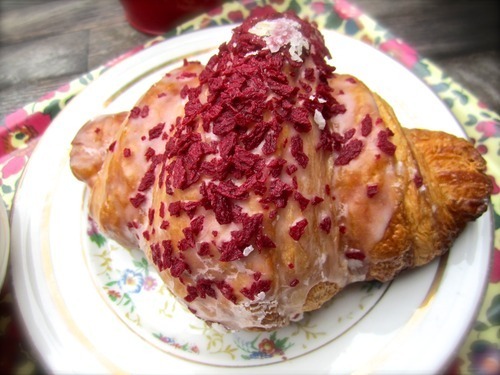 It seems too sugary…for a croissant. So I decided to first play with my food and take photos of it. Each and every bite is like heaven. I didn’t have time to take more pictures because the rose-rasberry-lechy balance was prefect. This is such an amazing croissant. Pleas, do yourself a favor and go to a PH boutique and try one…maybe even two. These are so amazing, and cheaper than a macaron! So sometimes you can’t judge a croissant by its looks! This entry was tagged croissant, ispahan, pariseats, Pierre Hermé, yum. Bookmark the permalink.